KUALA LUMPUR: A Special Marriage, Hadhanah (child custody) and Nafkah (maintenance) court, which has the authority to confiscate the property of a man who has failed to provide for his ex-wife, will take off in May. 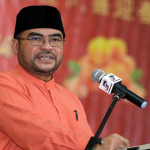 Minister in the Prime Minister’s Department (Religious Affairs) Datuk Seri Dr Mujahid Yusof Rawa said the court was now in the final process of getting the views of various parties on its administration before it is tabled to the Cabinet. “Maybe in two weeks’ time it would be ready to be presented to the Cabinet. After that, it would take between two to three weeks before it is approved,” he told reporters after officiating the Women’s Day 2019 Seminar at the Institute of Islamic Understanding Malaysia (Ikim). He said setting up of the court was a reflection of the commitment by Pakatan Harapan (PH)’s government to protect the rights of a woman who has been neglected by her ex-husband. Meanwhile, Mujahid said the three core thrusts of Islamic administration under the PH government – ‘rahmatan lil alamin’ (blessings for all), ‘maqasid syariah’ (syariah compliance) and the Malaysian module – would be tabled to the Conference of Rulers soon. The three areas were discussed, debated and agreed to by the National Council for Islamic Affairs which met for the first time last Thursday under the PH government. “What was agreed by the council will be informed to the Conference of Rulers. So the Rulers will know what the new government is doing for Islamic affairs,” he said. Special Marriage Court to start in May 0 out of 5 based on 0 ratings. 0 user reviews.